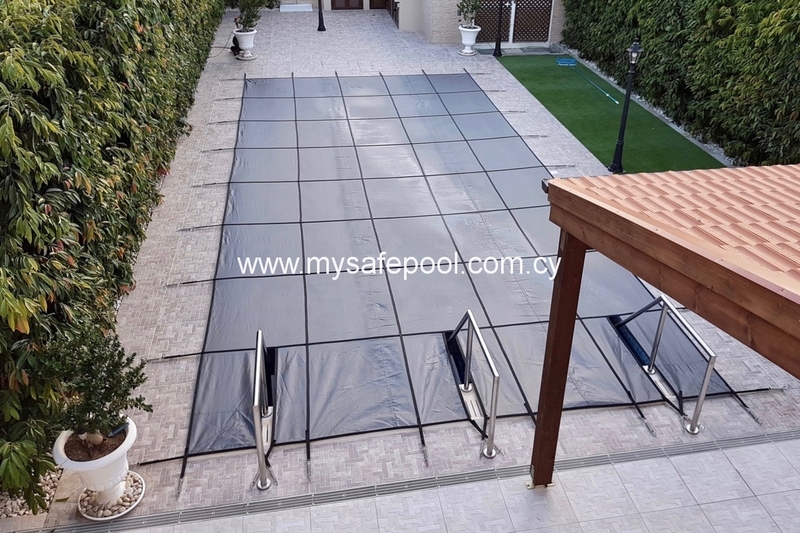 …just letting you know that the pool cover has worked great for the winter months and we managed to save both on electricity and chemicals during the winter months. …I absolutely love it, looks great and I can see even from the photos that the quality of the cover is very good! Thanks again for a job well done, I’ll be recommending you. We would like to take this opportunity to thank your company for a very professional job. 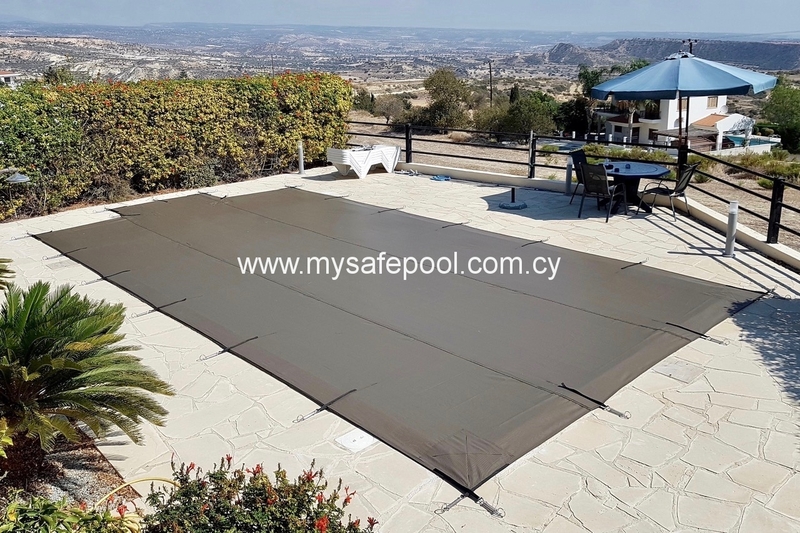 The service and advice we received was first class throughout and we are very pleased with our Apollo micro-mesh pool cover. 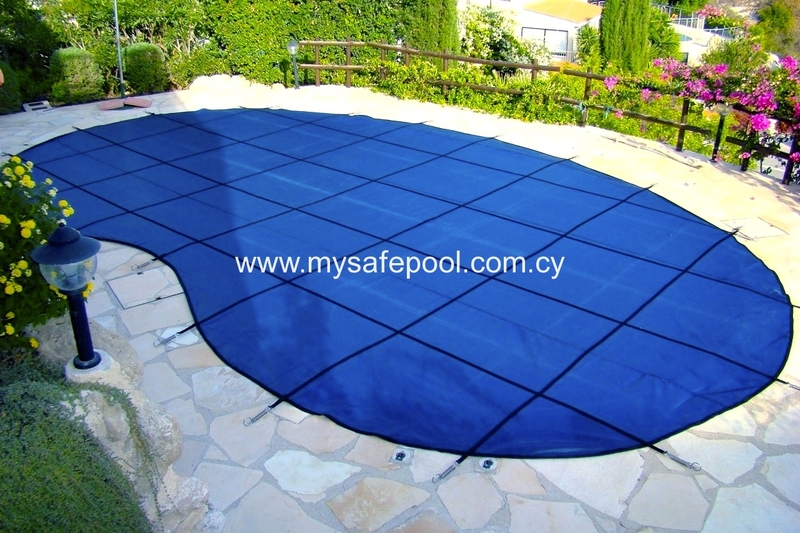 We would have no hesitation in recommending your company to anyone. 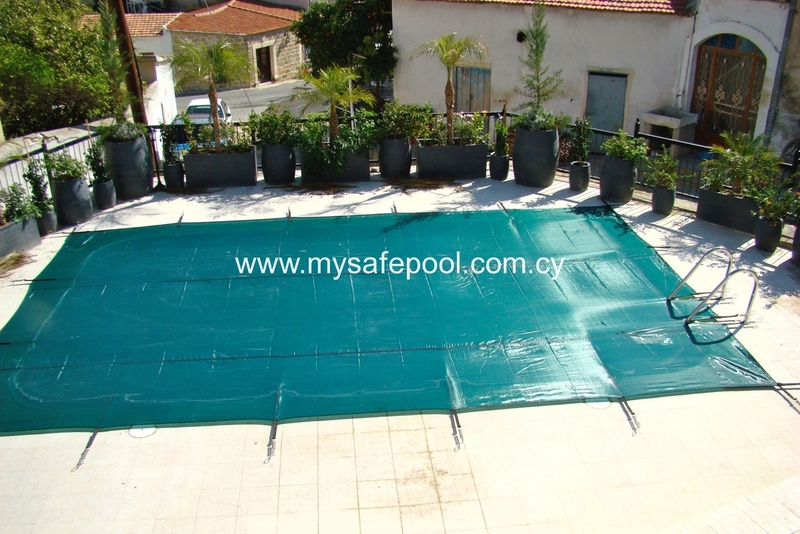 Just want to say “THANK YOU” for such a superb job of supplying and installing the pool cover. You did exactly what we required, in the timescale we required. How refreshing to deal with a company who does what they say. 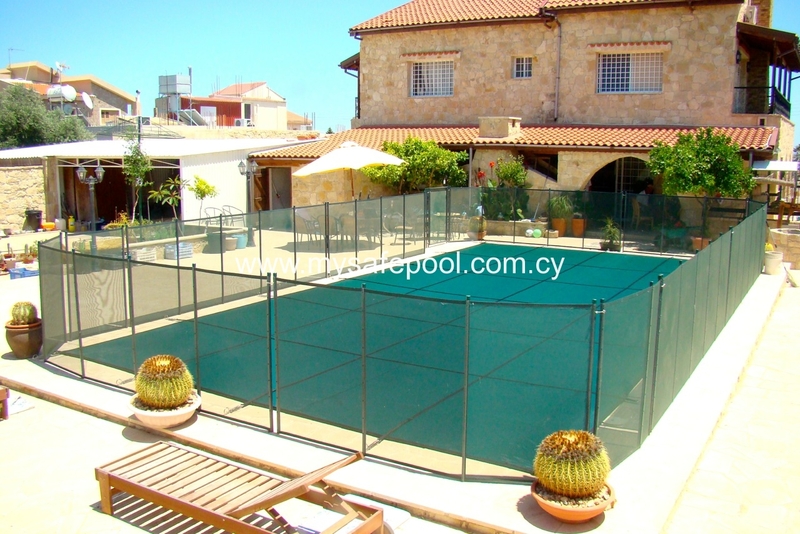 We are most impressed by the workmanship. 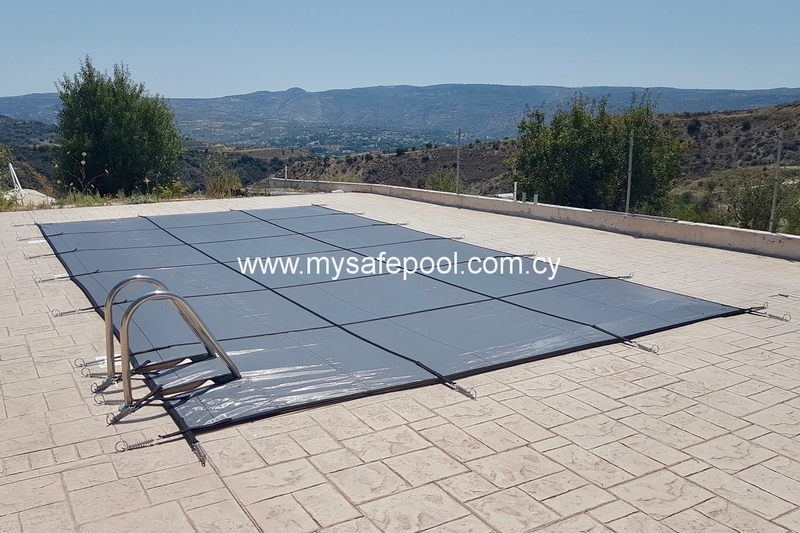 enables you to close down your pool over the winter months, saving you significant sums on electricity, cleaning and chemicals. For many customers, the outlay on the cover will be recouped from first year savings. 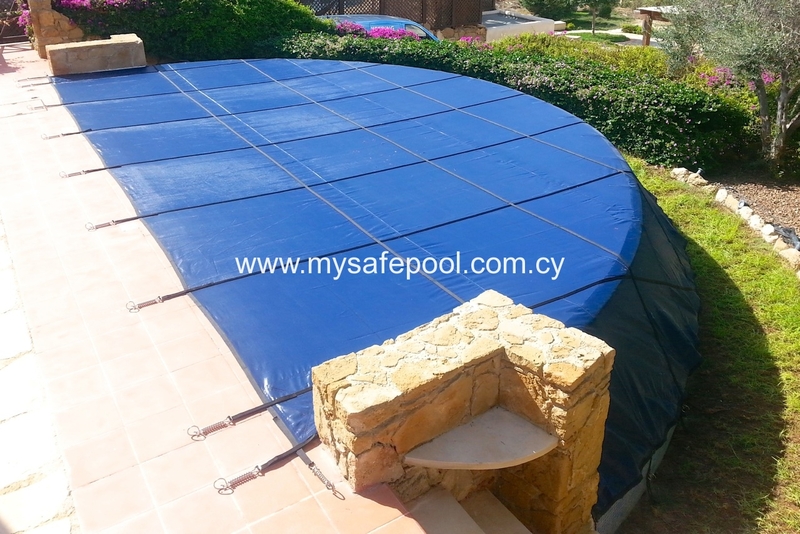 can reduce pool water evaporation by up to 85%. 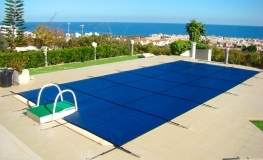 This means you save money by not having to pay for water to top up the pool. 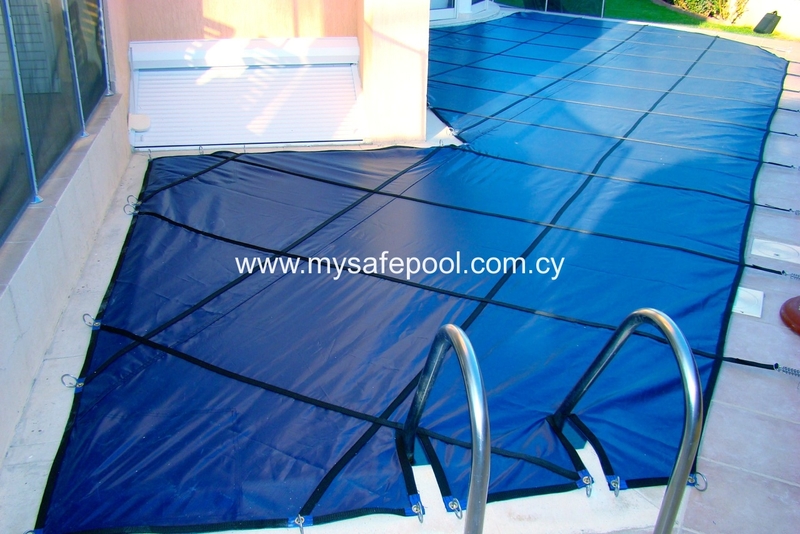 CONVENTIONAL COVERS: Winter covers have traditionally been made from solid PVC membrane. 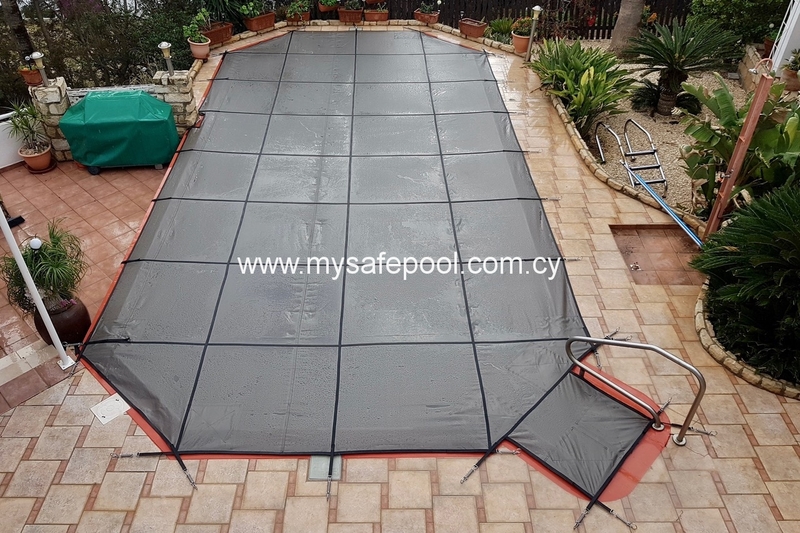 A drawback to this type of cover is that water accumulates on top of the cover whenever it rains, posing a safety hazard to young children. Leaves and debris become trapped in the water. 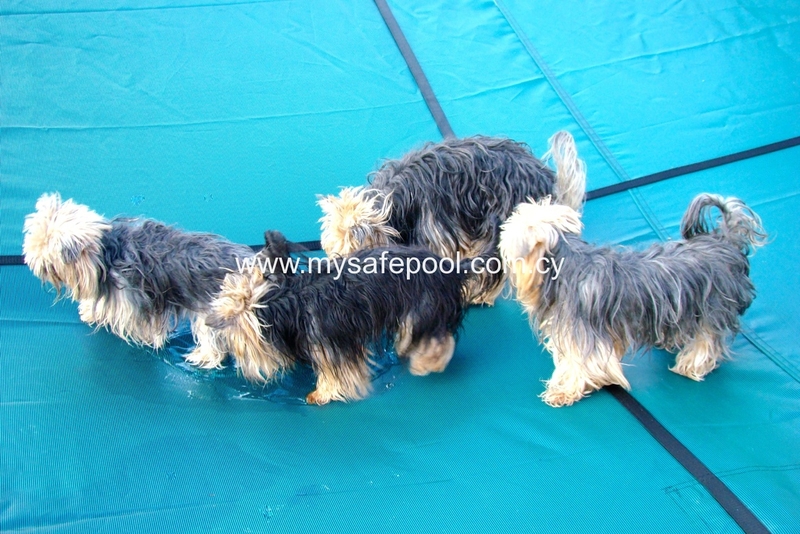 Unless the water is removed promptly it will stagnate and become a breeding ground for mosquitoes and frogs. 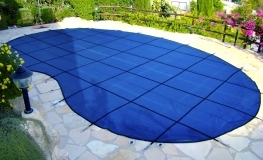 ‘APOLLO’ AND ‘APHRODITE’ WINTER COVERS ARE DIFFERENT: They’re made from a lightweight woven polyethylene mesh which enables them to be placed on the pool, and taken off, easily. 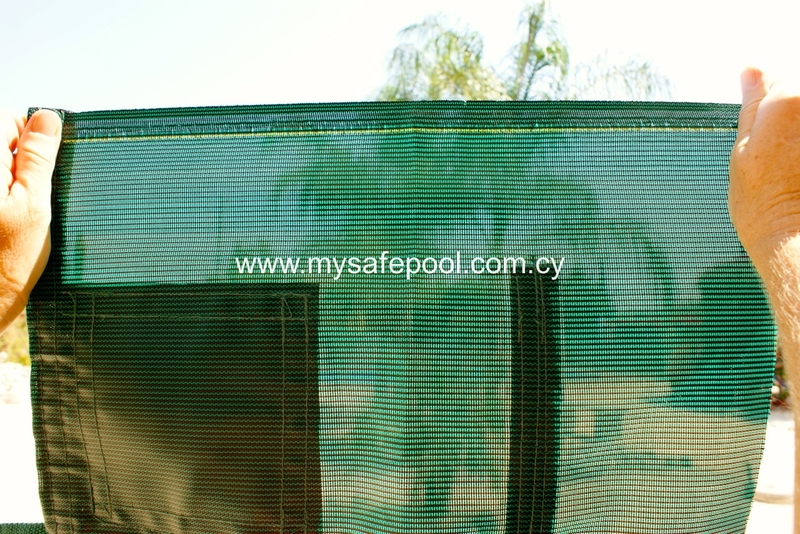 The mesh fabric allows rainwater to filter through the cover into the pool. 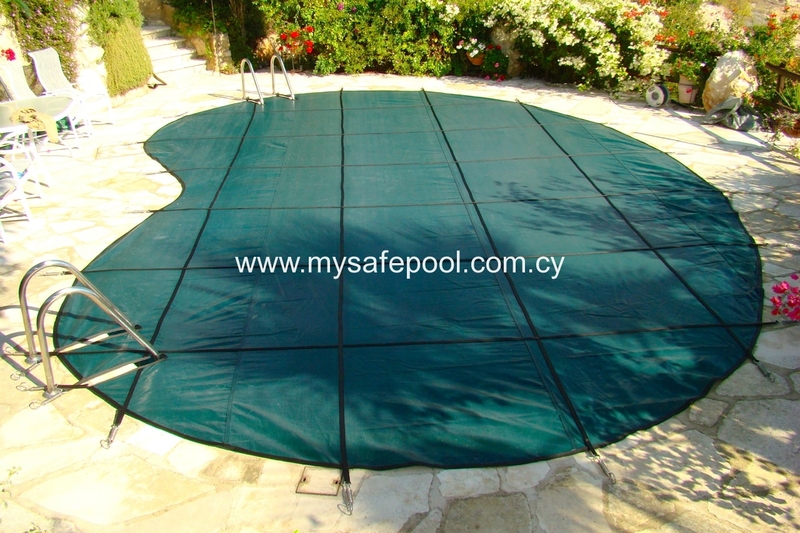 This means you will never experience a build-up of water on top of the cover. 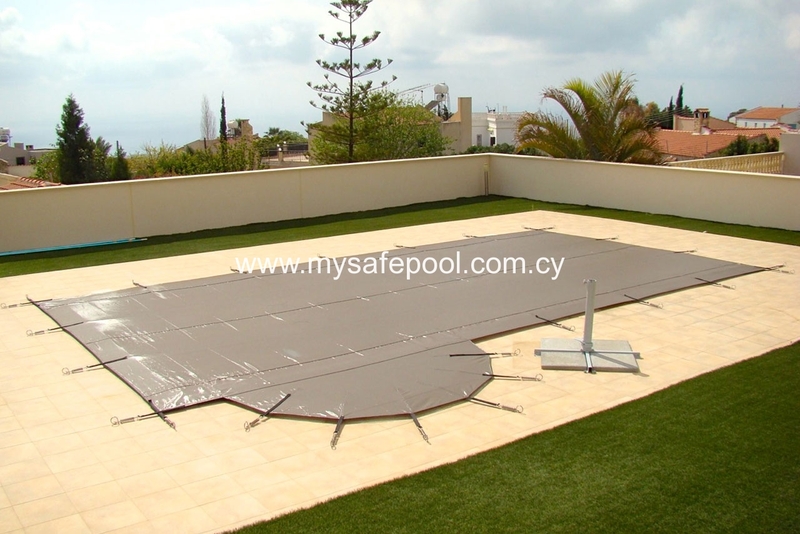 Instead, leaves and debris on the cover dry out quickly and are blown away. 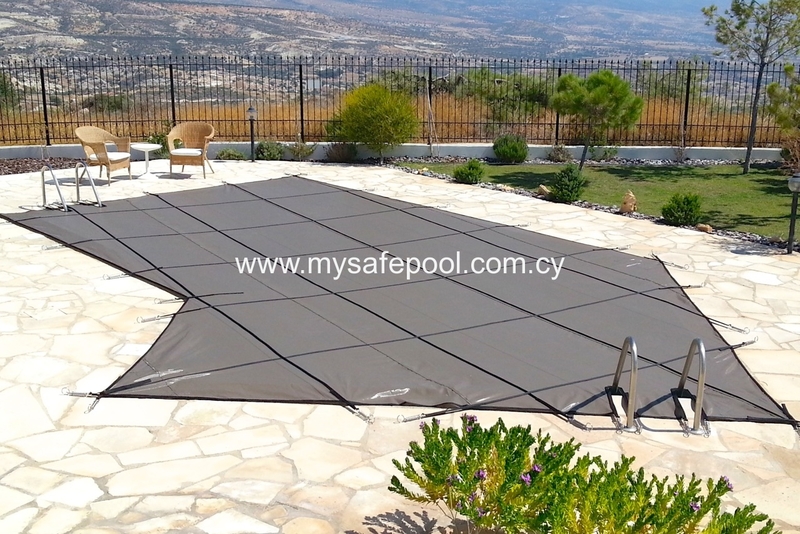 Our Apollo and Aphrodite covers look good and are designed to withstand the harsh Cyprus climate. Our basic cover is called ‘Aphrodite’. 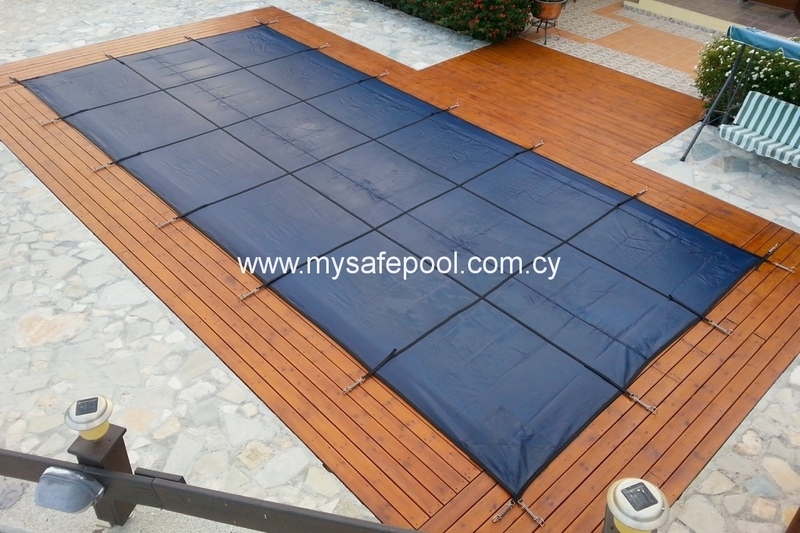 This is suitable for pools up to 9 × 4.5m. 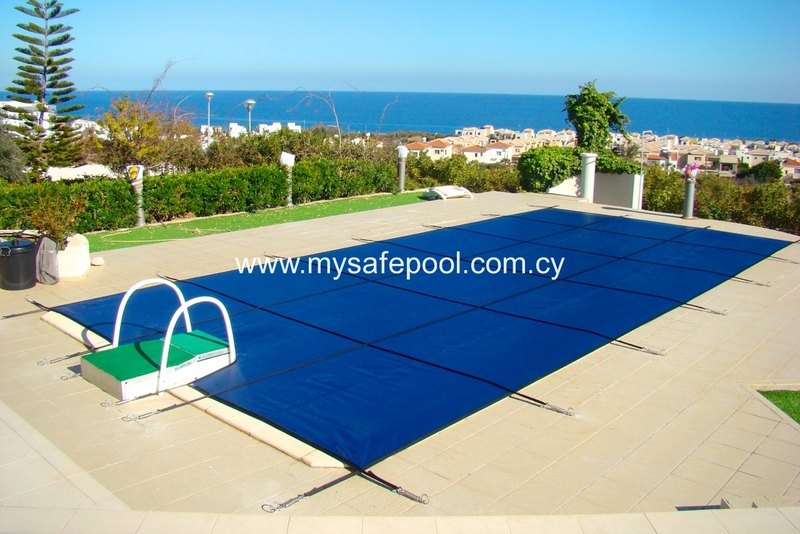 For larger pools, our ‘Apollo’ is more suitable. 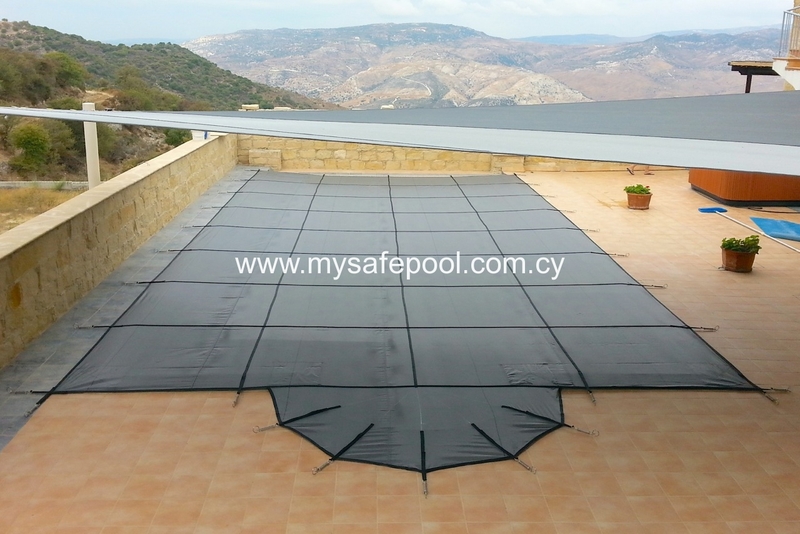 The Apollo cover has a latticework of webbing straps stitched across the surface of the cover. This reinforcement makes the cover much stronger. 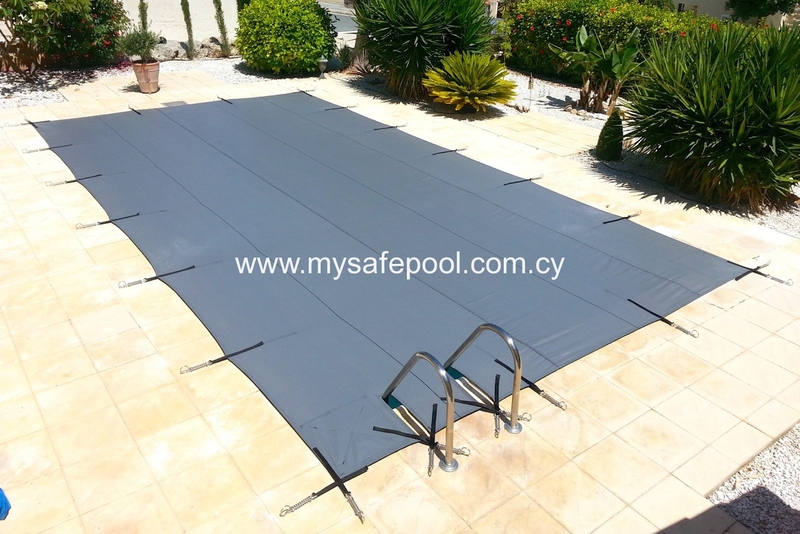 Apollo and Aphrodite covers are custom-made to fit any shape or size of pool. 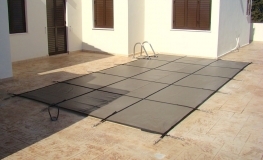 We manufacture each cover to fit around awkward shapes, curves, Roman steps and stainless-steel ladders. 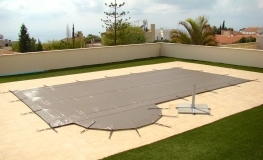 We incorporate a 20-30cm overlap all the way around the pool. 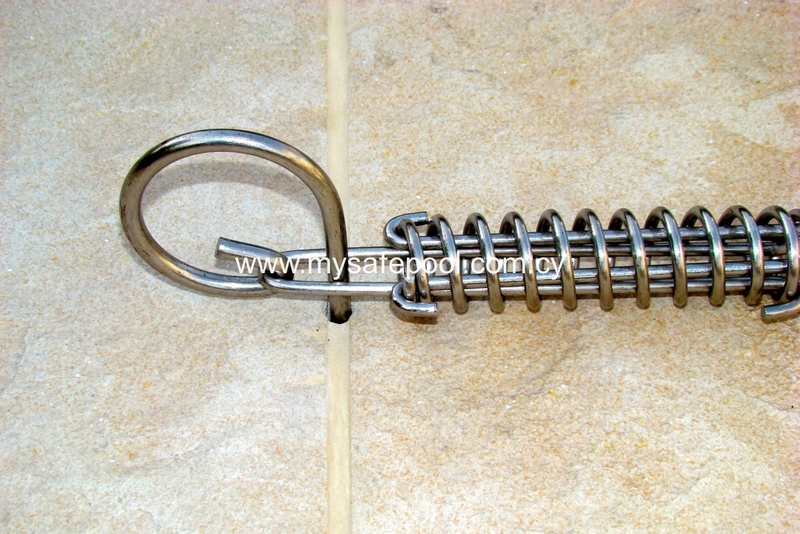 Stainless-steel tensioning anchors secure the cover at intervals of 120-150cm. 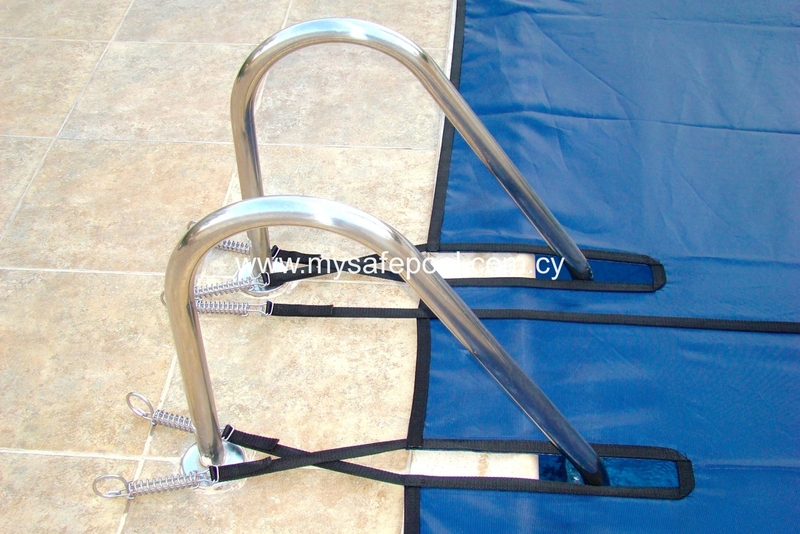 The strap running through each anchor can be tightened to keep the cover under tension. 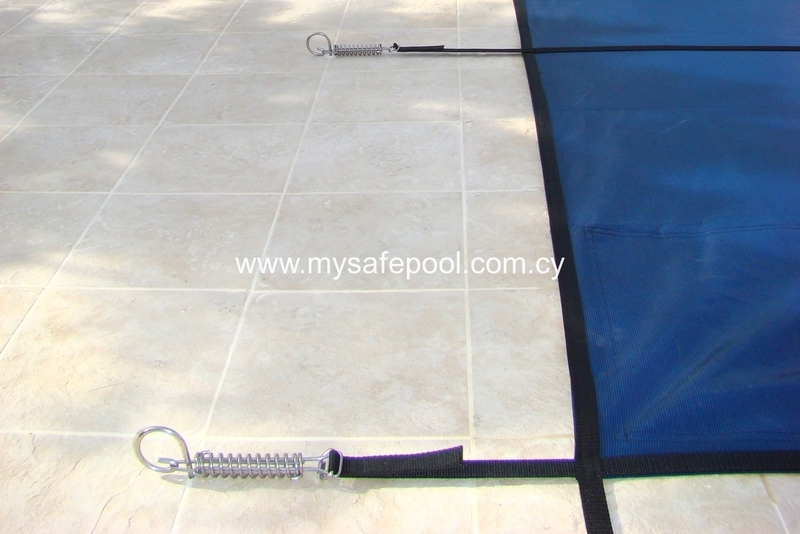 As the cover is removed from the pool, so too are the anchors. Nothing remains in the ground to trip over, or stub your toes on. 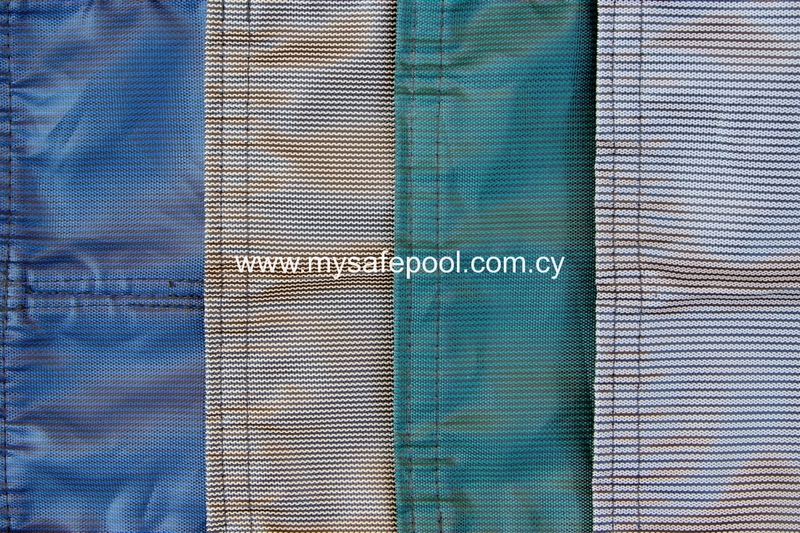 Our Apollo and Aphrodite covers come in a choice of four attractive colours: blue, green, beige and grey. See photos alongside. 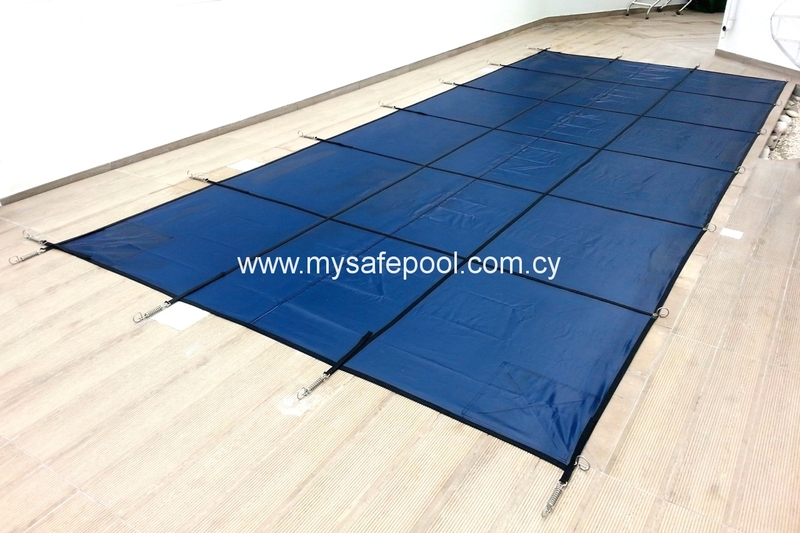 Each cover comes with a FREE storage bag. 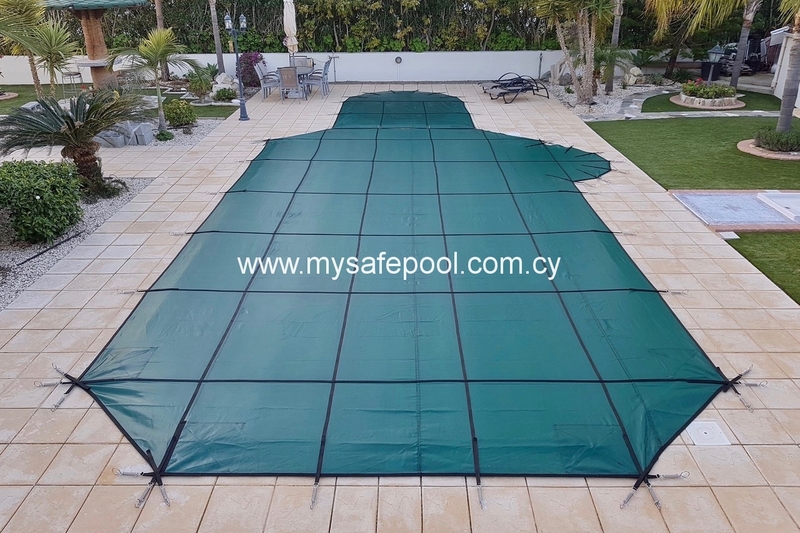 Professional installation of your new cover also comes FREE. See video below. 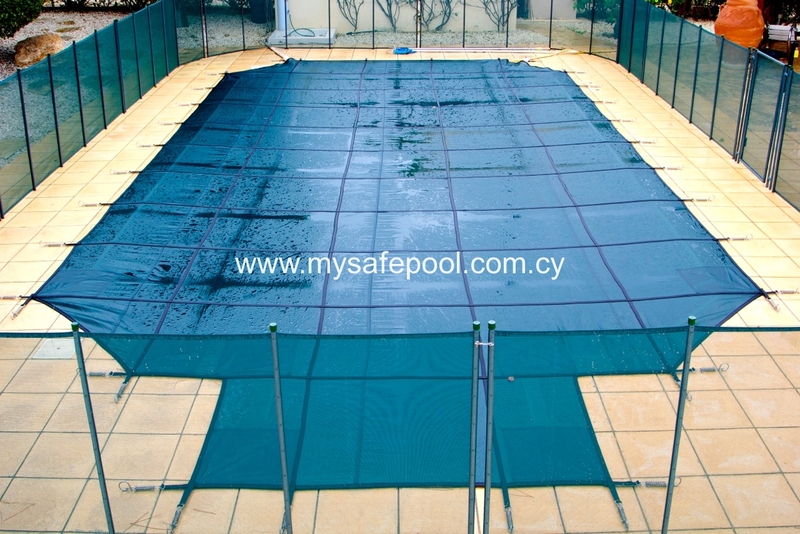 The good news: in spite of their innovative concept and premium quality, our mesh winter debris covers are very affordable. Please ask for a quote. 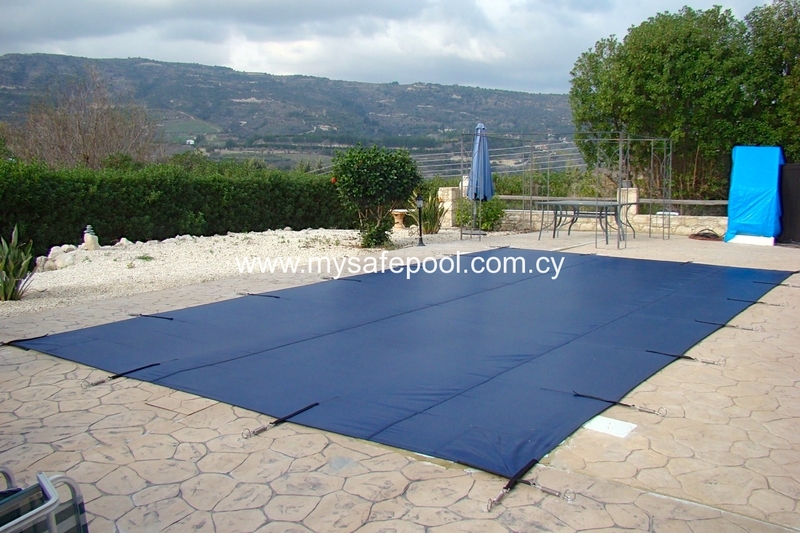 WARRANTY: Apollo and Aphrodite covers come with a conditional 3 year warranty. 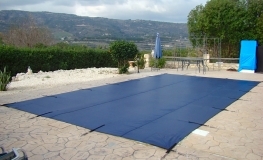 INTERNATIONAL ORDERS: We’re happy to ship winter debris covers almost anywhere in the World. Please ask for a quote.